What can you tell us about your new release, Her Final Word? In this book Jack Ryder travels to the Bahamas with his adoptive daughter Emily to try and find her realthe family. But all they can find is a woman who’s in jail for murder of a young girl six months earlier. The girl was found floating in her own pool in one of the wealthiest neighborhoods in the world. As Jack Ryder digs into the story, he finds secrets buried so deep no one thought they would ever see the light of day. If Her Final Word is turned into a movie, who would you pick to play the main characters? I always thought Matthew McConaughey would be a good fit to play my main character Jack Ryder. Name a book that you feel has impacted your life significantly? Why was it so impactful? The Never-ending Story has always been my favorite book. It’s just a really beautiful book. I remember reading it as a young girl and loving how it transported me into this strange and dying world. The thought that there could be a universe parallel to ours that was only surviving by human imagination, was so compelling. To think that just because people stopped reading books, there was an entire world of imagination that would die. I remember thinking it was the most awful thing. What if people forgot to use their imagination? I couldn’t think of anything worse. Writing or reading. My two favorite things to do. A machine that could give us more time. Or a teleportation device so I could visit my loved ones in Europe faster. Do you listen to anything while you write? If so, what’s your audio of choice?? I always listen to Florence and the Machine. What scene in Her Final Word was your favorite to write? The final one. I love it when the characters go through something and then grow stronger from it. 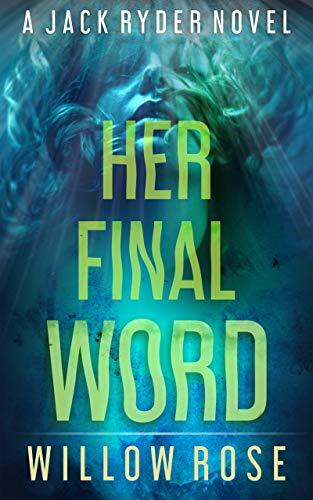 Willow Rose is the author of the new book Her Final Word.